So many lions! So many lambs! The pic for this month is from one of the more lion-y days. My balcony was in a cloud and even my balcony buddha couldn't see a thing. I had to shoot this through the window because the wind was so strong I couldn't even open the balcony door. Other, more lamb-y days meant nice walks on ice-free sidewalks and wearing only a jacket and no boots, hat, or gloves! 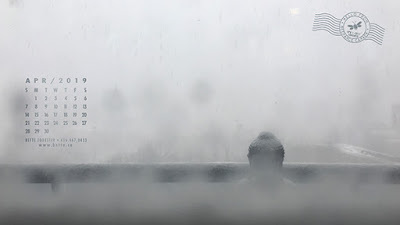 Looking at this picture and thinking about the goulash/ragout of this March's weather stew had me searching for a word that started with a nice lion/lamb-y alliterative L. But no! Instead, I found one of my dad's favourite words: slumgullion. I always thought he had made it up. When I was a girl, he always brought me to giggles saying it. I knew it was a mixture of a bunch of stuff thrown together without rhyme or reason. I knew that because that's what he told me, but I still thought he had made up the definition along with the silly word.Guess my funny daddy wasn't quite so original as I had thought. Seems "slumgullion" has a history mostly referring to stew-type foods enjoyed by the poor. Here I'm enjoying using it more like Good Old Fred Forester might have done. And that made me think of Good Old Fred's favourite word for an undefinable colour: "muckle-dee dun." So I looked that up, too! Seems it's a real colour used in various forms to describe tan horses. My daddy was a farm boy, so my guess he knew that. And he was just having fun with the word... and my giggly reaction to it. I managed to make it through all the lions and all the lambs and now I'm lollygagging—and giggling. If this isn't nice, what is? Bet you didn't know this though: Pi is represented by the lower case Greek letter, π, because it is the first letter of the Greek word περίμετρος, meaning perimeter. You pronounce it "per-REEM-eh-tos." Go here to hear it pronounced. 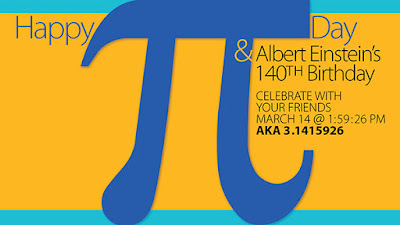 Here are some other PI celebration ideas for the rest of us. 3.14% of the sailors around the world are “Pi”rates. Divide the circumference of the sun by its diameter and you will get a Pi in the sky. I tell you, do not talk to Pi. He never stops. 5. Click HERE below for a higher resolution of this Pi Day graphic to decorate your desktop for the day! How ever you decide to slice it, have a great day honouring how math is always looking for ways to explain nature. The circle is just the beginning. I first read of David Reynold's Constructive Living concepts in a magazine article around 1984. His exercises reminded me of some work I had done in university (20 years before) in Paul Baker's theatre class called "Integration of Abilities." Part of the work in the class involved developing an ever-widening vocabulary to describe our every-day experiences. 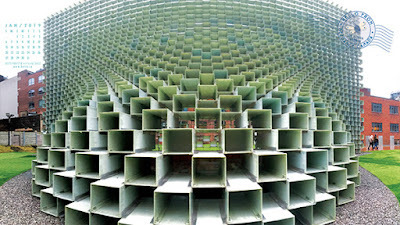 The result is not only more subtlety of expression but NOTICING MORE! I saw this over time with myself and my classmates, then later with Susan, a high school student where I was the substitute teacher for one of her classes. Susan had a remarkable capacity for observation plus a vast vocabulary to describe her nuanced world. Turns out that as a young child she had been a part of Paul Baker's Children's Theater and had done many of the same exercises I had done. We happily shared our excitement about our every-day observations... and I consider myself still in Baker's class. That's why I was inspired by the Constructive Living exercises to learn more. 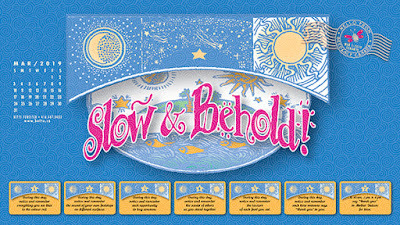 And... that's when the first iterations of my own Slow & Behold! exercises began. At first, they were simply typed on little slips of paper and folded and put into a round goldfish bowl for a daily random choice. Over the years I refined the set to include noticing things we see, things we hear, things we feel, things we feel, and things we taste. Yes, all 5 senses. Research shows that most of us consciously experience only 1 or 2 of our senses. The others become also-rans or simply fall by the wayside. We experience them... we just don't notice them. AND we don't develop a vocabulary to enhance our experiences of them. Leonardo, himself, had noticed this and he also gave himself exercises to inhabit all 5 of his senses. Guess I'm in good company, eh? Anyhow about 2006, I developed Slow & Behold! into a deck of 60 cards and had them printed. Kate recently reminded me that I still have some of that inventory left, all nicely shrinkwrapped. She's been bugging me to open an Etsy shop and offer them to the public. I have now done that—plus I've made a Slow & Behold! journal to go with the cards. Explore my Etsy shop here. There are a number of other things I've made over the years and I thought it would be fun to share them all in one place. 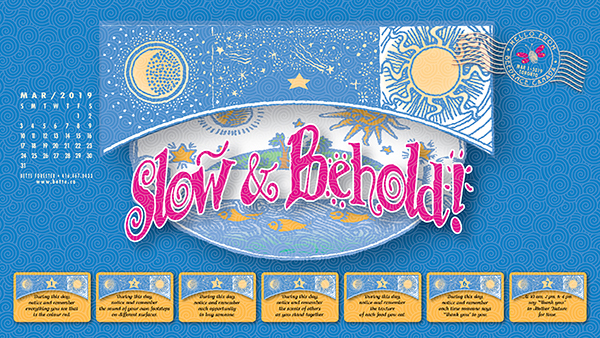 In the meantime, I invite you to try a Slow & Behold! sample across the bottom of this month's calendar. Try it for a week and see what you think. I'm also offering you a free sample of the PDF journal here. It includes directions. I'm quite happy with my Etsy shop header. I used a newly developed font for the shop name. It's called Sans Forgetta and it was designed to help you remember what you read. The idea is for students to use it for studying digital notes that they take in class for studying later. Here's the Sans Forgeta story. I love the name! You can download it here for free for both Mac and PC. 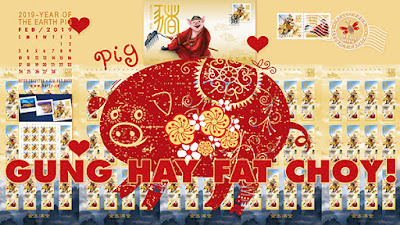 As is its wont, Canada Post has issued its annual stamp marking Chinese New Year. Their offering this year is adding lots of joyous smiles to my face—and my heart. Guess that's because St. Valentine's Day is conjoined, eh? 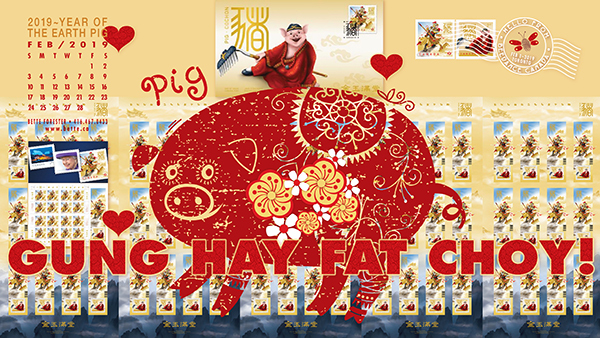 Beginning Feb 4th we're entering the Year of the Earth Pig. According to Chinese astrology, that means this is a great year to make money and a good year to invest! This year is going to be full of joy, a year of friendship and love for all the zodiac signs—an auspicious year because the Pig attracts success into all the spheres of life. I found this little piggy pop-up card on a wikihow page. Seems particularly appropriate for this month’s celebration, don't you think? They’ve included a file download for this white piggy, but I’ve adapted it to match my calendar’s red and patterned piggy. Go grab my happy file (along with the instructions) from my DropBox here. 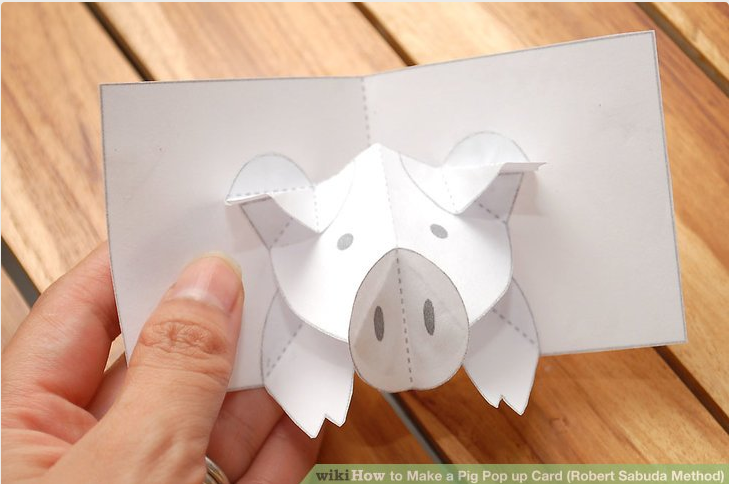 Be sure to send me a pic when you've made your own piggy pop-up card. A fresh new start... with fresh new perspectives! And think a different think? I just think about the think? 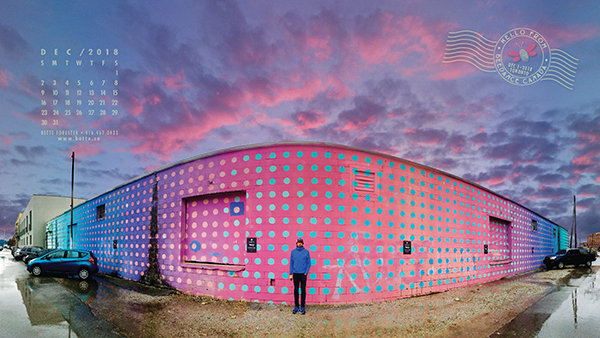 Last month, Chatanooga had dots. 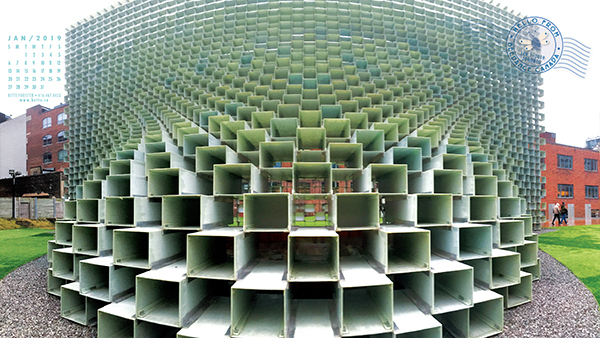 This month, Toronto's got squares. 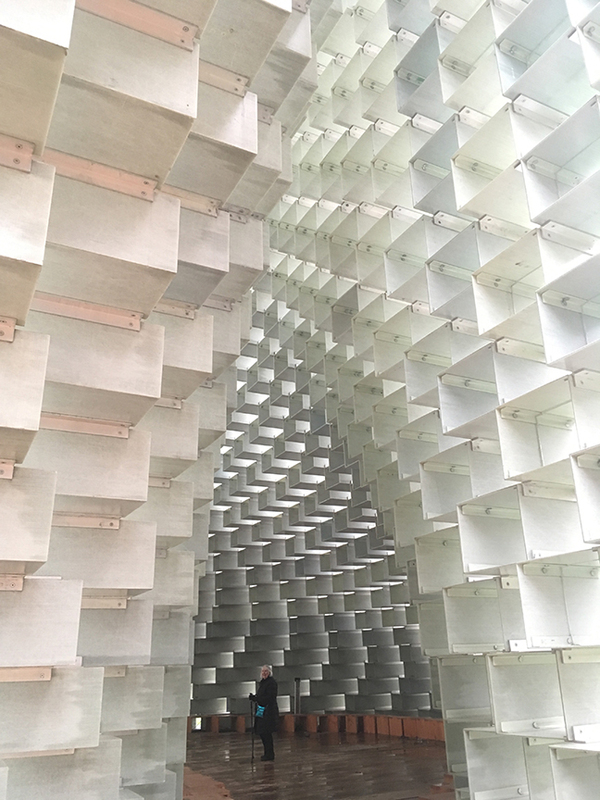 The image for this month's calendar is from a lovely New Year's Eve visit to Bjarke Ingels' Unzipped, the Serpentine Pavilion in Toronto (just east of Portland St. at 533 King St. West.) Be sure to click on the link above and watch the film! You can walk through Unzipped as well as around it and each glance offers all new perspectives. Here's another perspective... yes, that's me lost in the shadows and looking out! The day before this new month began Kate and David explored Chatanooga, where they found these (apparently famous) dots in a laneway across from the Chatanooga Choo Choo Hotel... which, of course, makes me want to hum and to tap dance to Glenn Miller's Chatanooga Choo Choo. The very next day, this same David ran 50 miles in 11 hours and 7 minutes in this trail race near Chatanooga! He was still standing afterwards, but I suspect he might choose not to for a while. I've been looking for clues about these dots. The parking tags you see are for a company named Very, whose web address is verypossible.com, where they say they're "remarkable people solving complex problems." Nothing there about dots—even complex ones. Google tells me there are lots of sites listing these dots as a perfect background for Instagram pix. 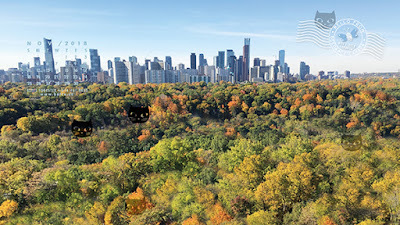 Indeed, Google shows lots of those dotty pix, both amateur and professional. But so far I've not been able to find whose dots these are and why they are where they are. Kate and David's dotty day was covered in a post-rain grey. I thought these dots deserved a sky that reflected their more psychedelic splendour. Thank you to my former neighbour Agnes, for this glorious Alberta sky. Seems perfect for a city obsessed with murals, eh? Maybe I'm just getting too dotty... or we need to change the pronunciation of dotage to have a short O? I've hidden five black cats for you to discover in recognition of this night's spooky activities. Then you can spend November in contemplation of Nature's on-going festivities. Our colours are arriving late this year, but they're still resplendent and changing hourly. My memories of Arthur VanTowsey. Every month, some people like to use my calendar for their desktop. Want this month's calendar for your desktop? For a higher resolution version of this month's calendar, click here. To subscribe to the monthly email version of these calendars, click here. Born in the Pacific Northwest... grew up and went to school in the South, where I began my graphic design career. Then I lived and worked for 4 years in Australia, before moving to Canada, where I've been now for over 1/2 of my life. All this moving about means I'm tri-lingual: all in English. Production design for packaging is my speciality. I began my study of astrology in Sydney and continue with great passion. I'm the centre of clam and I believe in proofreaders. All content in this blog (except where noted) is original art, poetry & photography by Bette Forester and each is copyright the year noted. The creations I share here are for personal entertainment only and may not be copied for publication or contest submission. Enjoy!